Pet Professional's Choice Brand sorted and trimmed bully sticks are real thick and the best available. 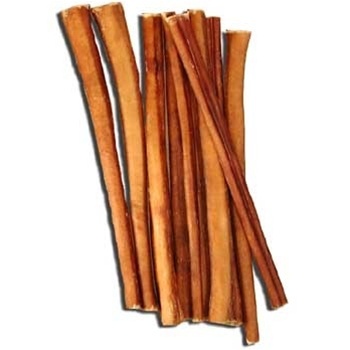 Bully Sticks are an all natural treat that contains no additives or preservatives. Bully Sticks are a great way to maintain your dog's teeth and gums while satisfying their desire to chew. Bully sticks are an enticing treat all dogs adore! Thick bully sticks are loaded with flavor, one bite and your dog will be hooked! Bully Sticks are 100% all natural dog treats, 100% digestible and low in fat. Approx. width 1/2" - 3/4". USA No Odor 5-6" Twisted Bully Sticks 1lb.